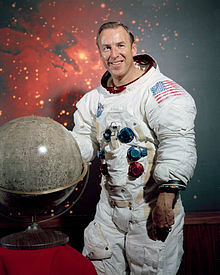 Jim Lovell (born March 25, 1928) is a former NASA astronaut and test pilot. He was pilot of the Apollo 8 and commander of the Apollo 13 mission. Crew of Apollo 13 mission failed to land on Moon because of loss of electric power and failure of both oxygen tanks due to technical problems. Because of efforts of crew and ground control room, all three astronauts aboard Apollo 13 returned to Earth safely. This page was last changed on 28 March 2019, at 03:19.